Volunteering is one of the best things you can do to kick-start your dream career as a zookeeper. It helps you get experience, it allows you to showcase your strong work ethic and it gives you the opportunity to start forming connections in the industry. If you’re still not convinced, read our post on what to expect from zoo volunteer work to hear more reasons why. Sometimes joining a zoo volunteer program is as easy as making a phone call. But other times, especially if there’s a waiting list, you may need to prove your mettle before being accepted into the program. Keep reading for advice on how to avoid common pitfalls in the zoo volunteer application process. 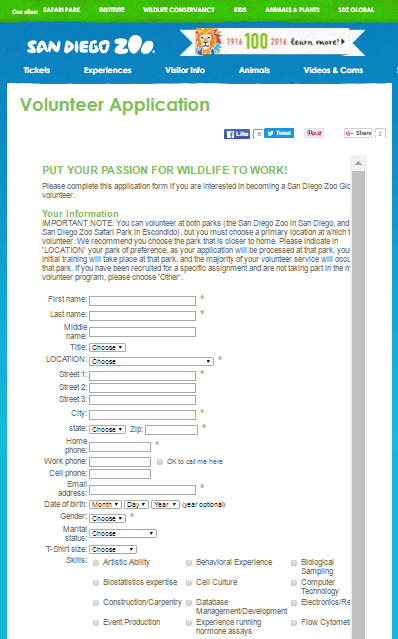 How do I find out about zoo volunteer programs? A zoo’s website is the best place to start. Read everything you can find about their volunteer program and follow the instructions provided on how to apply. If you can’t find anything, go to their Contact Us page and make a polite phone or email enquiry. Most likely they will send you out an application form. They may request a copy of your resume as well. Believe it or not, there can be many different types of volunteer in the one zoo. Some may only assist visitors in the park, and others may work in administrative positions. If you want to become a zookeeper, though, you’re best off applying for the volunteer positions that let you work alongside the zookeepers and their animals. have realistic expectations of what zoo volunteers really do. If the volunteer coordinator you’ve been in contact with is worth their salt, they should have given you a run down already on what sort of jobs their volunteers are permitted to do (spoiler alert: you’re going to be spending a lot of time with either a rake or a hose in your hand!). Make sure you know what to expect before you go any further with the application process. research the zoo. The more you know about the zoo, the better the impression you’ll make. Read over their website and, if possible, spend a day at the zoo itself. check if there are any restrictions. For example, some zoos require volunteers to be over 18 years of age. Committed – Training volunteers takes time, and time equals money, so they want to know you’re dedicated to the role. Physically capable –It’s important you are fit enough to meet the demands of this physical role. Flexible – both in work hours and the animals you’re happy to work with. Switched on – A zoo is a potentially dangerous place. They want someone who has common sense and can think on their feet. Remember that the volunteer coordinator’s aim is to find people who will make the zookeepers’ lives easier. By all means mention that your goal is to become a zookeeper and that you love animals, but keep it professional. Most volunteer coordinators have had to deal with a volunteer who was so passionate about a particular animal that it actually led to problems, with the well-meaning volunteer constantly harassing the keepers with their questions and requests to get closer to that animal. Needless to say, those volunteer coordinators don’t want to make that same mistake again, so don’t you make the mistake of thinking that sharing your passion with them is the most important thing. They are looking for hard workers who are easy to get along with and have a sensible head on their shoulders, so that’s what you want to convey. Also, try not to put too many limitations on your availability and what sort of volunteer work you’re prepared to do. The more available you are, the more appealing your application is. If you’re lucky, this is where you get called and accepted as a zoo volunteer. For some programs, you may still have to undergo a volunteer interview. If you’re at this point in the process, congratulations! Don’t freak out, interviews for volunteer positions are unlikely to be anywhere near as intense as a regular job interview. You’ve already done a lot of the hard work. You’ve researched the zoo, now all you have to do is practise answering some questions. Here are a few interview questions you might get asked. How long do you see yourself volunteering here for? What sort of things are you expecting to be able to do while volunteering? How much animal handling are you expecting to be able to do? How would you cope working in different weather conditions? Is there any type of animal you are unable to work with/near for any reason (e.g. phobias, allergies)? Treat it like a professional interview. Dress appropriately, arrive early, speak clearly and be friendly and confident. You’ve got this! don’t stand back. Jump in and participate! be on the lookout for ‘tests’. For example, they may take the group into the food preparation area and show you food items like dead rodents, just to make sure you can handle the daily realities of keeper life. You’re not expected to love it, obviously, but a potential volunteer who has a big negative reaction may be indicating to the staff that they’re not right for this sort of work. Don’t let any of this scare you, we’re just trying to give you as many insider tips as possible. Take the zoo volunteer application process seriously, treat the volunteer coordinator with respect, and you’re already well on your way. 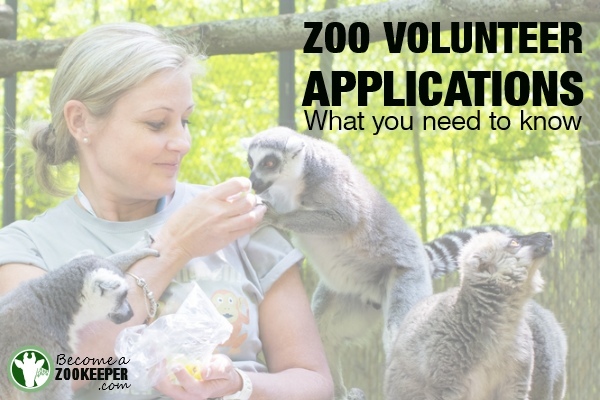 Then, once you score that coveted volunteer position, you’ll be one step closer to your dream job, and perfectly placed to crush it as a zoo volunteer!